In defense of the garlic press: while I generally agree with your disdain, I hardly think you can lump a $4 tool (no bigger than a couple of spoons) in the same category as a $500 tool (the size of a pumpkin), especially since the average layman will do way more garlic-pressing than cheese-scraping in a lifetime. Hi Dianna, it’s true garlic presses are not nearly the waste of money (and space) that a Raclette Machine is, but I’ve never found them to work as well as the side of a chef’s knife. Also, they are very difficult to clean. touche. They are a PITA to clean. 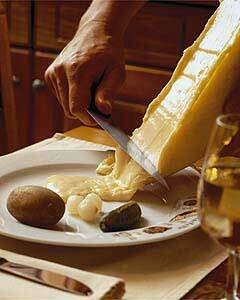 I for one love my raclette machine. I used it at least twice a year. It is great for more than just cheese. We did make your own enchiladas last Christmas. It is not like being infront of a fireplace but it is a great way to have fun with friends and family and let them create their own fun dishes. And cleaning my marble top one is no problem. The nonstick one is another story. Thanks for a great article. Raclette machines – bah!Besides cluttering up the kitchen cabinets and costing too much, they can’t do a thing if the power goes out in a winter storm. Ah, but a hunk of cheese and a crackling fire,and some chilled white wine: that’s a way to survive a blizzard!